General Hospital (GH) spoilers reveal that Jason Morgan (Steve Burton) survived the unknown for five years and fought like hell to return to Port Charles and his loved ones, only to learn that another man was living his life, quite literally! Tests quickly confirm that the second Jason was in fact, his twin brother, Andrew “Drew” Cain (Billy Miller), a Navy SEAL, that no one knew existed. Jason, reminds GH fans why he was called “Stone Cold” in the first place, as he steps back and holds his emotions in, and does what the love of his life, Sam (Kelly Monaco) wants and needs; which at the moment, seems to be his brother. Drew, on the other hand, continues to show hostility and on several occasions has had angry outbursts towards Jason. This hostility of Drew towards his twin could be understandable considering the circumstances but if you think of Helena Cassadine’s (Constance Towers) curse to Sam and combine it with all the twin mapping, you’d realize there is so much more going on here. Helena’s exact words to Sam were, “I curse you Samantha Morgan. You, those who begot you, and those you begat, and all those who touch you. You and yours will never know happiness in this life, nor any other!” Pitting Drew against Jason couldn’t make those words any more true! Sam wants to believe that Drew is her present and future while her love for Jason is in the past, but she doesn’t wish ill-will for them. General Hospital spoilers tease that Drew was clearly Helena’s “Soldier Boy”, as she was often caught referring to him as. As days are going by, it is becoming more clear that the Mastermind had a backup plan, had Jason ever escaped and attempt to reclaim his life, it would trigger Drew to kill him. Before Jason returned, Drew had turned his back on the moblife and was settling into the media business with Sam; no violence at all. Jason returns and there has been nothing but outbursts and angry confrontations from Drew since; it seems very plausible that he has been programmed to carry out a sinister execution of his twin brother. 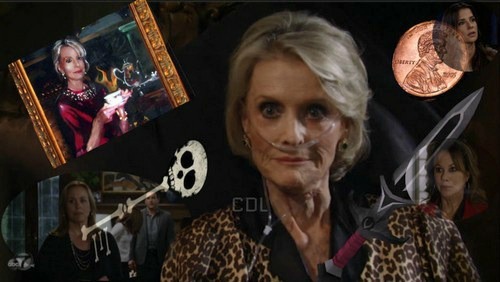 Be sure to tune into ABC’s General Hospital to catch up on everything happening in Port Charles right now. Check CDL’s General Hospital (GH) spoilers often for updates, news, rumors and spoilers!